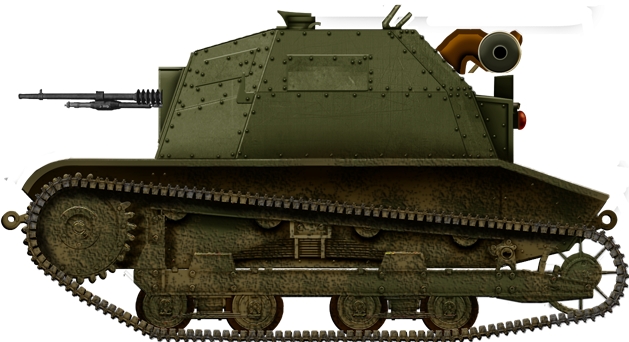 From 1931 to 1934, the TK-3 tankette was the main tankette in Polish service. 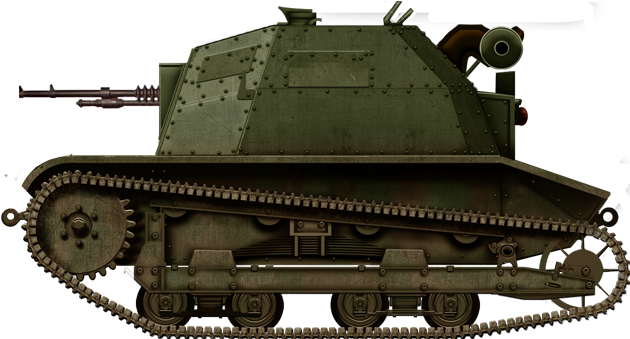 This small vehicle evolved from the TK-2 prototype, which in turn was derived from the British Carden-Loyd Mark VI tankette. Tankettes were a fad of the interwar period, small, fast vehicles, limited by thin armor and weak armament. 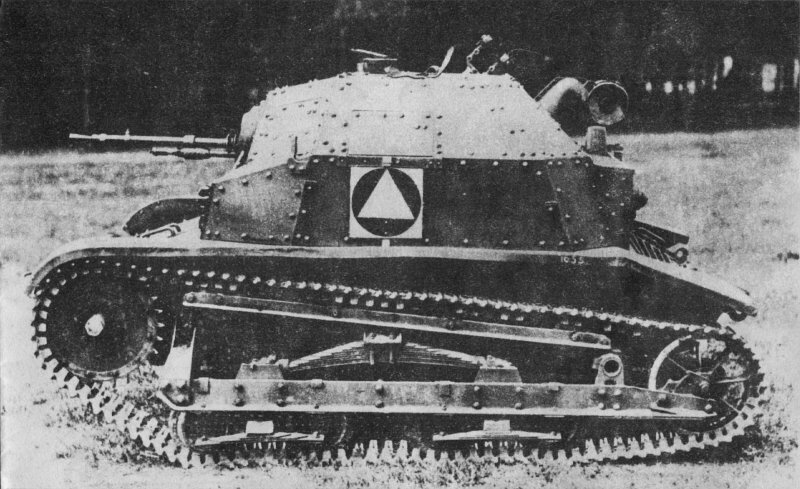 The original TK-3 tankette. Notice the mounting for the rear idler, the teething on the drive wheel and also the front mounting of the external suspension bar. Polish designers, seeking to improve the TK-3, built several prototypes trying to improve various aspects of the tankette concept. These prototype vehicles were the TKW (turreted), TKD (47 mm/1.85 in gun), TKS (different construction) and TKF. The TKF had the most modest upgrades to the TK-3 and consequently, the TKF is often mistaken for the TK-3. The TKF was essentially a standard TK-3 (production number 1221) with a FIAT 122 AC engine. The American Ford A engine used on the TK-3 was replaced by a more reliable and easier to import engine. The designers chose the Italian FIAT 122 AC engine, as it was already being produced in Poland with a license. The first prototype of the new tankette, designated the TKF (abbreviation of “TK-with-Fiat”), was ready in 1931 (other sources state 1932). In 1933, more TK-3 tankettes were converted. The final number of TKFs built is reported to be somewhere between 18 and 22 tankettes. This number is often mistakenly included in the total number of TK-3 tankettes. The success of the FIAT engine in the TKF resulted in its usage in another tankette, the TKS. 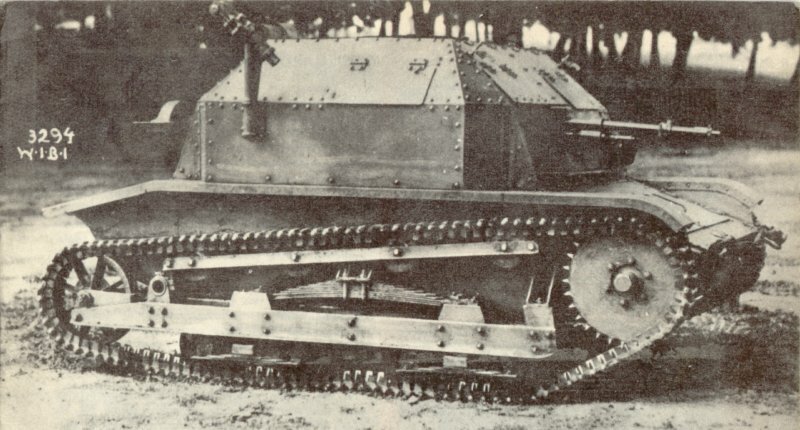 In 1935, when the TKS tankette was already in production, the designers upgraded the existing TKF tankettes with the suspension and tracks of the TKS. The trial was successful, and plans were made to convert all Polish TK-3 tankettes into TKFs. However, similar to later prototypes, like the TKS-B, upgrading the tankettes was rejected as too expensive (then tankettes were mainly used for reconnaissance). The improved TKS tankette. The different hull shape and MG mount are immediately noticeable. The suspension changes are more subtle. The drive wheel is different, as is the mounting for the idler and the front mounting for the external suspension bar. The initial and most important upgrade of the TKF was the new engine. The FIAT 122 AC produced 42 hp, in comparison to 40 hp of the Ford A. It allowed the TKF to achieve a slightly better maximum speed of 46 km/h (29 mph). Moreover, the new engine was smaller than the Ford A. In 1935, the TKF tankettes got their only visually-distinctive modifications, when their suspension was modified with elements from the TKS. The idler wheel (on the rear) received a new, stronger mounting (and more circular in shape). The front drive wheel implemented improved teething and other features of the suspension were strengthened. The upgraded TKFs also had broader tracks for improved traction. The designers modified other parts as well, including the gearbox, brakes, steering wheel, gas levers, clutch, radiator, fan, manual starter and electric installation (from 6 to 12 V). The only Polish unit confirmed to have used TKFs was the 10th Motorized Cavalry Brigade (created in 1921). However, according to some sources, not all the TKF tankettes were part of this unit and some served in other units. In September 1939, the 10th Motorized Cavalry (using their tankettes) engaged the German army near Jordanów, during their march to Lwów (Lviv). When the Soviets also invaded Poland on September 17, creating a new eastern front, the 10th Motorized Cavalry Brigade was ordered to move southwest and cross the Hungarian border. On the 22nd of September, the 10th Motorized Cavalry Brigade arrived in Hungary and surrendered their equipment to the Hungarian army, including 9 surviving TK-3s and TKFs (exact number of TKFs is unknown, as they are commonly mistaken for TK-3s). Some TKFs may have been captured and used by German and Soviet armies, but this has not been confirmed. The Hungarian Army used the Polish tankettes and later supplied them to the Croatian Army. Afterward, the Croats used the tankettes against communist Yugoslav guerrillas. In March of 1944, one TKF was captured by Yugoslav soldiers and later placed in the Military Museum in Belgrade. This is the only known TKF that survived the war. Do Yo mean photos or color sketch ? There is only one TK-S i article on the photos..
All other are either TK-F or TK-3. Notice the difrence in placement of MG mantle and it’s shape. But there is other mistake’s. TKF did not differ externally from TK-3. The main difference between TK-F and the TK-3 was different engine. TK-F did have the Polski Fiat 122 AC. Sligthly and only visual difference was the suspension of The idler wheel and the shape of the mounting bracket’s of the suspension frame to the hull. it’s probably just late production model or a field repaired one. It’s not clear and rather non logic that TK-F’s of late production have suspension elements of TK-S’s. I’m late, but I found the one wartime photo of TKF – http://www.nowastrategia.org.pl/wp-content/uploads/2013/12/10bk.jpg (or http://2.bp.blogspot.com/-0Tdc2mT-Jjg/TfmwmqhYcVI/AAAAAAAAEKo/YqsBYYhEaWE/s1600/aaa.jpg). The first tankette in the row looks as TK3, and the mounting of the idler wheel looks like in TKS – so this tankette is possible TKF. 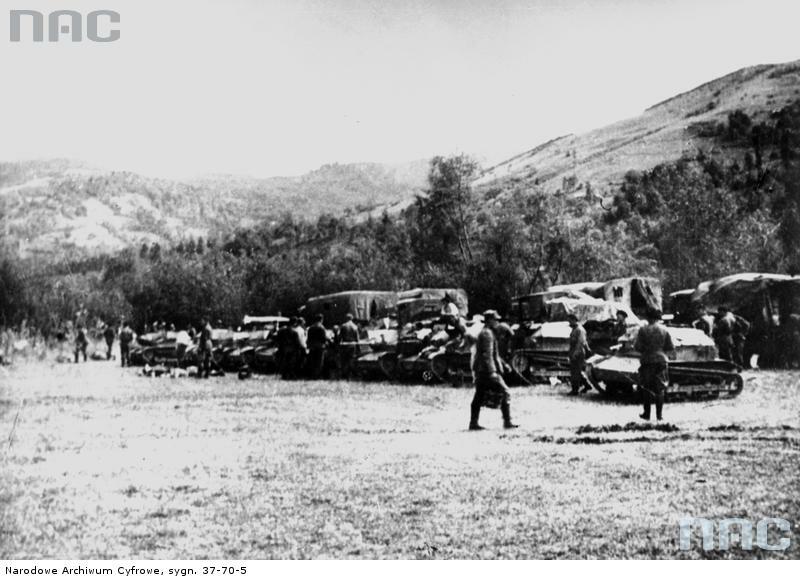 The photo shows vehicles of 10 BK (10th Cavalry Brigade, the users of TKF) after crossing the Hungarian border, so it fall into place with the story of TKFs.